Jana, a powerful witch, and Tigan, a deceitful mercenary from Sabe's and Kiera's past, join forces to summon Samyaza, one of the most powerful of all fallen angels. The witch strikes a bargain with the fallen angel to possess Tigan, making him indestructible in battle. In exchange for granting this gift, Samyaza seeks a sacrifice, someone gifted with seraph abilities so he can free himself of the bonds that hold him captive in hell. If you could sum up Angel Within in three words, what would they be? What does Scott Richard Ehredt bring to the story that you wouldn’t experience if you just read the book? He's very good. It's obvious he's an actor. I would have if I could have but work wouldn't allow. Sold into slavery when he was six years old, Kai has never known love. As he reached maturity, his slavers realized Kai was no ordinary man. There was something else lurking inside. An uncontrollable force that feeds on his rage and anger gives him the advantage when thrown into the pits of Darkmide to fight for his life. There he learns that killing brings rewards - after each win, he's given a female slave to sate his sexual needs. 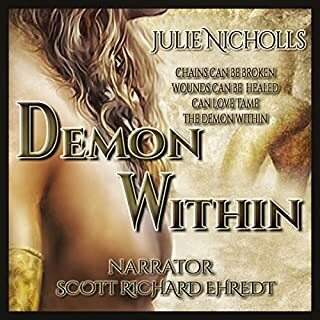 Where does Demon Within: A Story of Angels & Fallen Angels rank among all the audiobooks you’ve listened to so far? What was one of the most memorable moments of Demon Within: A Story of Angels & Fallen Angels? Kai of Darkmide is no angel.